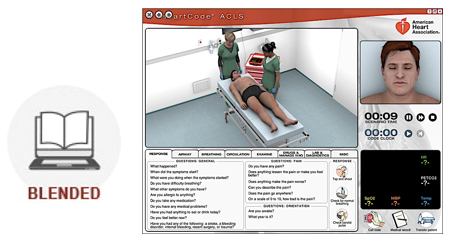 HeartCode® Advanced Cardiovascular Life Support (Online Part 1) is a Web-based, self-paced instructional program that uses eSimulation technology to allow students to assess and treat patients in virtual healthcare settings. In this environment, students apply their knowledge to real-time decision-making and skills development. Debriefings and coaching are provided immediately after each simulation to facilitate learning. HeartCode ACLS Part 1 is for healthcare professionals who either direct or participate in the management of cardiopulmonary arrest and other cardiovascular emergencies, specifically those seeking an alternative (nonclassroom) method for completing an initial or update ACLS Course. This includes personnel in emergency response, emergency medicine, intensive care and critical care units. HeartCode ACLS Parts 2 and 3* should be completed in one “skills practice and testing” session. Upon successful course completion, including demonstration of psychomotor skills competency in all learning stations by passing the CPR and AED skills test, bag-mask ventilation skills test, and a Megacode test in addition to a written test, students receive an American Heart Association (AHA) Advanced Cardiac Life Support (ACLS) course completion card, valid for two years. This continuing education activity is approved by the American Heart Association, an organization accredited by the Continuing Education Coordinating Board for Emergency Medical Services (CECBEMS), for 12.00 Advanced CEHs, activity number 11-AMHA-F2-0119. This continuing education activity is approved by the American Heart Association, an organization accredited by the Continuing Education Coordinating Board for Emergency Medical Services (CECBEMS), for 5.25 Advanced CEHs, activity number 11-AMHA-F2-0127. Once the course fee has been received, our staff will give the student a 90-1405 HeartCode ACLSPart 1 Key Code through email, phone, or at the facility to be used for online access to activate the course.